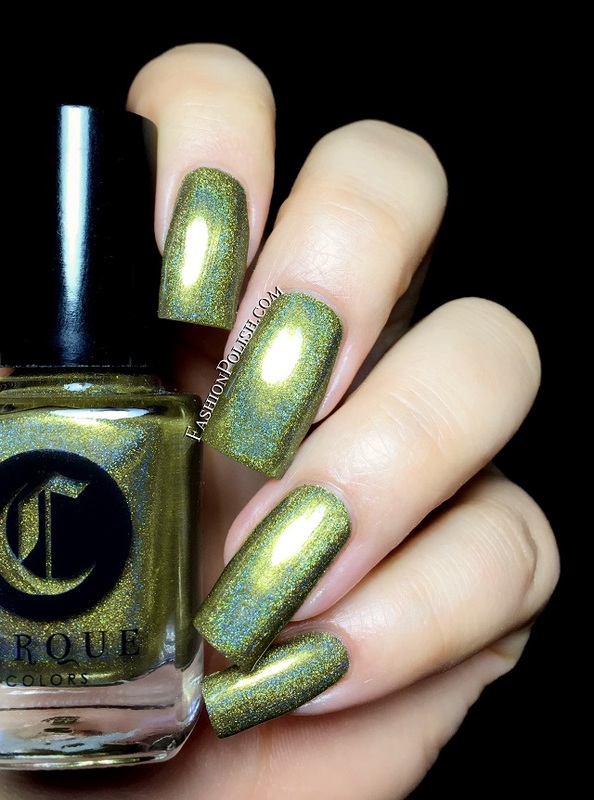 Fashion Polish: Cirque Colors Burlesque collection swatches & review! Cirque Colors Burlesque collection swatches & review! I hope you've had a great weekend. All is good here and I'm slowly catching up on posts. So today I'll have 2 Cirque Colors reviews to share with you, first up : the Burlesque collection. "From musicians to magicians, Cirque Colors drew inspiration from vaudeville shows of the early 20th century to create a 4-piece fall collection called Burlesque. These sultry holographic shades embody the lush and dramatic stripteases that put such acts like the British Blondes and Gypsy Rose Lee on the map. Josephine, a dark forest green, pays homage to Josephine Baker (the original twerker) and her famous banana dance. While the navy blue hue of Trocadero represents a night out on the town at the historic Philadelphia theater." Harlow is an antique gold with a strong green hue and warm shimmer that casts a strong linear holographic rainbow. Yellow based golds don't work so well on me and I was surprised to see how complimenting this one actually is. Used below : 2 coats. 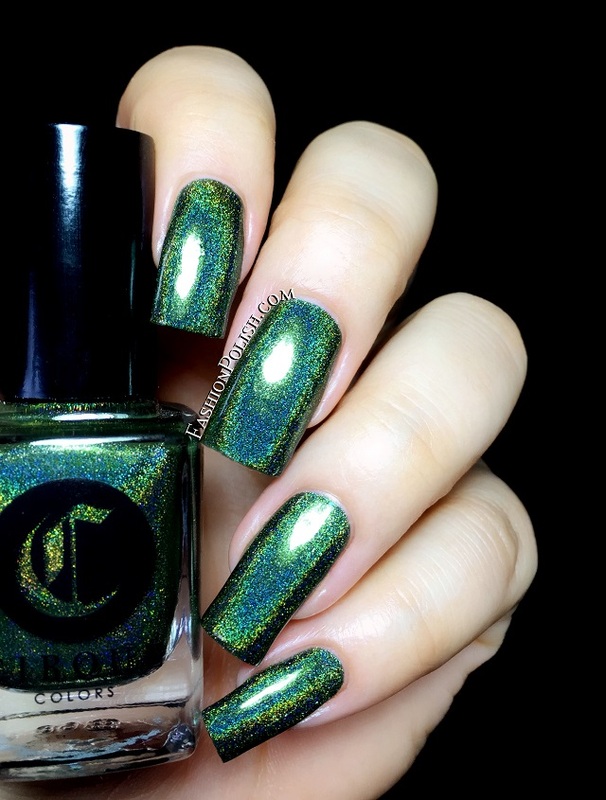 Josephine is a dark green linear holo with a cool hue and a gold flash. Green lover, radar mode ON, you'll love Josephine! Again, 2 nice and easy coats shown here. 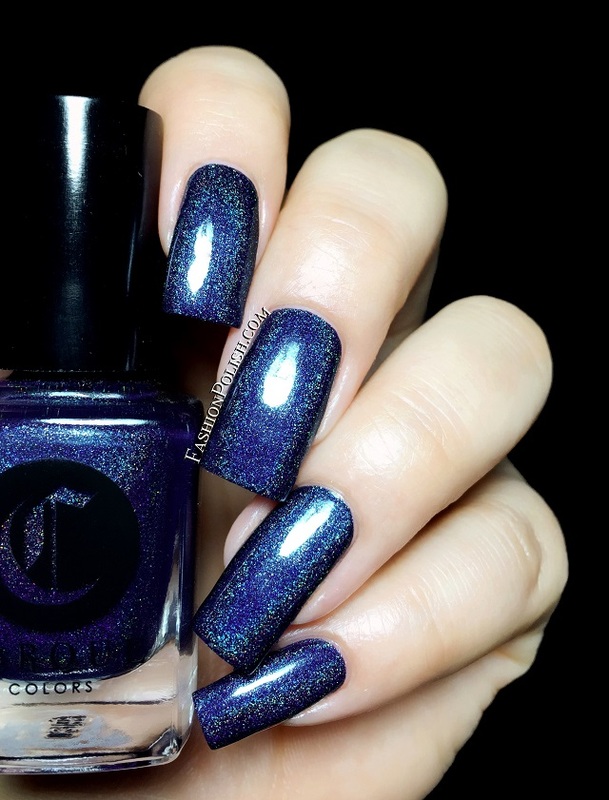 Trocadero is a navy blue linear holo with sparse silver particles. I especially love the contrast between the cool and muted base against the holo flame, such a pretty color. I also used 2 coats for full coverage. Boudoir is a vampy burgundy holographic, perfect for the season! Being a burgundy hoarder, this one screams my name. Again, 2 easy coats below. 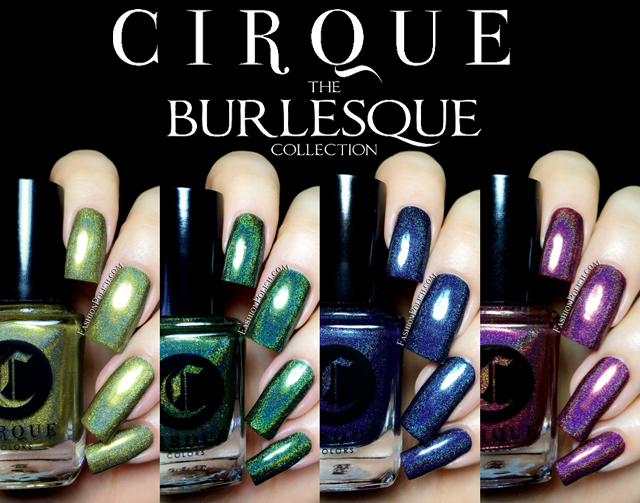 The Cirque Burlesque is already available on cirquecolors.com and retails for $13 each. For a list of international Cirque stockists, please refer to this list. So what do you think about this collection. Any favorites? Mine : Boudoir and Trocadero as a close second! Stay tuned for the second Cirque review today : the November Metropolis shade, Knickerbocker.